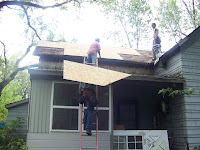 Finally, the roofers came out to reroof the front two sections of my house. The last time those sections had new shingles was thirty years ago. 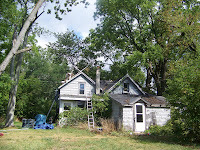 There were three layers of shingles on top of the original old cedar shake shingles, so everything had to be torn off. The cedar shingles had a life of fifty years, then each layer of shingles might have had a life of 30 to 50 years which would take the house back 140 to 200 years ago, so the newest parts of the house were roofed the first time somewhere between the Civil War era and the settlement of Michigan in the 1830s. 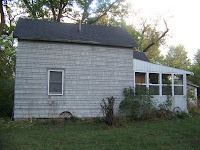 The older part of the house is shown on the right side of the left hand photo above. The ceilings in that part of the house were so low that my hair almost touched the ceiling (and I'm only 5'4") so either the early settlers were very small people or they built the house low so it would be easy to heat. The two sections in front were built differently. I've always thought they were sections from other houses that were dragged over here and attached to the original house. They were built with a mixture of the old handmade nails and the early machine made nails which might date the construction to about 1850 - or, maybe they were built earlier and then brought over and joined together around 1850. 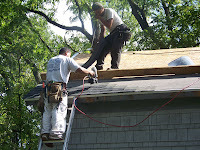 The crew that came to do the roofing consisted of about ten men - with only two who spoke a little English. They all worked really hard and really fast. 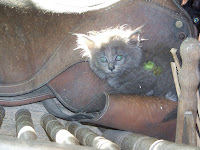 I just happened to spot this poor little kitten while I was watching the roofers. Poor thing has some burrs on her back, but I would have scared her half to death if I tried to catch her to take them out. Maybe her mother will help her. 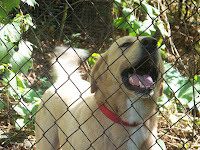 Gibby did not like having all those men around, but his barking wasn't loud enough to be heard over the generators they were running in their truck. I think Gibby was barking, "Roof, roof, roof, get off my roof, roof, roof." 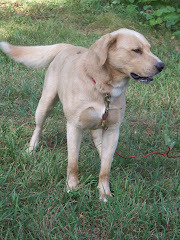 Later, when the roof was finished and the men were gone, I let Gibby out to run in the yard. 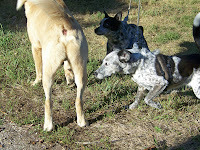 The cattle dogs were on their leads attached to their line between two trees. They did their best to attack Gibby, but he was smart enough to stay just out of range. The new roof looks pretty good.